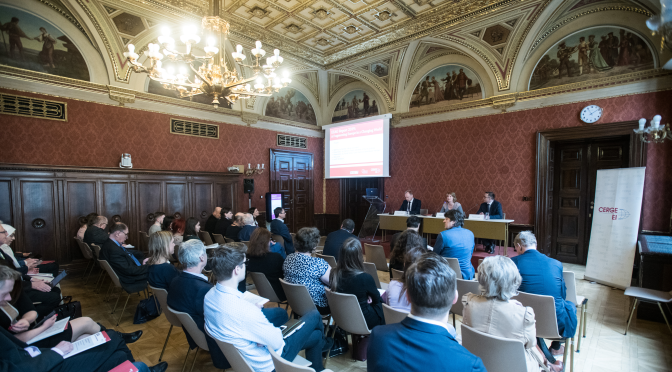 On 26 March 2019, Clemens Fuest of the ifo Institute at the University of Munich came to CERGE-EI for the second year in succession to present the latest EEAG report to a full audience. Prof. Fuest started by defining the fragmenting aspect in the title of this year’s report, explaining that the new Italian government that went against many of the EU rules when defining their budget last year and the ongoing Brexit negotiations have contributed to a destabilization of the EU. The main part of the presentation started with a look at the macroeconomic conditions in Europe. Prof. Fuest commenced this section by stating that the Czech Republic is in the best possible condition, with its main problem being a lack of workforce. Other main indicators covered were GDP growth, a survey of the world economies by continent, and finally the global economic policy uncertainty index, which is worryingly higher than at any time in more than 20 years. The focus of chapter 2 of the report was on the poor performance of Italy over recent years. It was highlighted that this is not just a problem in specific regions of Italy, as is often believed, but when the economic performance was broken down by area, it was visible that the country is failing as a whole. It was made clear that it is not desirable for Italy to leave the EU, for example as many of their large companies are in huge debt to the EU and any exit would result in the immediate repayment of those loans and bankruptcy of at least some of these firms. Moving on to China, the impact of trade on the EU economy was considered, showing the continuing rise of Chinese imports to the EU. However, in comparison to the US, the EU has taken the opportunity of utilizing these imports better to also improve its exports. He stated that the EU remains open to trade with China without more tariffs than currently exist, in contrast to the US, although Chinese investments in the EU are being questioned as there is concern about excessive Chinese influence and takeovers. Some of the evidence based on a study of Chinese foreign acquisitions showed that state-owned enterprises (SOEs) have been active in the natural resources, manufacturing and infrastructure sectors, which is similar to SOEs from other countries. Chinese (SOEs and private enterprises) acquirers, however, are paying less for their takeovers, often searching for distressed companies. One of the main conclusions of the report is that the EU needs to use the leverage it has as a larger group of nations to push for reciprocity when it comes to investment, particularly with infrastructure. Prof. Fuest stressed that a common European policy is necessary if there is to be sufficient bargaining power when dealing with China in order to maintain a more even playing field. Tomas Holub, Czech National Bank board member then took to the podium to add the Czech perspective on the EEAG report. He opened with a look at Euro area (EA) convergence and commented that there are several countries that have not converged to the desirable level, notably Italy, Greece and Portugal. Czech economic convergence has recently resumed after a pause during 2010-2013. Per capita GDP reached 83% of the EA19 in 2017 and is rising. Contrary to this, the price level has not performed so well and is only at 65% of the EA19. Czech wages at purchasing power parity are roughly 60% of the EA19 average. Despite the fact that the Czech Republic is more economically prepared for euro adoption than ever, Holub stated that it is not desirable at the moment due to on-going challenges within the eurozone, although it may be desirable in the long term. Following both of these informative presentations the floor was opened to questions from the audience for the final 30 minutes of the session. The lively Q&A session included topics covering Chinese acquisitions, the role and importance of exchange rates in calculating the figures presented, and the recent slowdown in the EU economy. Related to the last point it seems that the future of the European economy is largely dependent on what will happen in China and the US. The issue of trade reciprocity with Russia was also questioned. Fuest said that Russia is a very different situation from China; how far the arms of the Russian government reach is an important consideration and the size of the Russian economy is not as significant as China’s and therefore Russia is not such an attractive proposition for trade expansion going forward. Convergence was questioned further and in particular whether there will be a European state, being that we have a European currency. The answer came that provided we have a central bank that works well, a single European state will not be necessary. Prof. Fuest believes that despite challenges and imperfect situations, the status quo can continue effectively.